At EXPLO, we believe in putting good things into your body. That means filling student hearts and brains with creative ideas and curiosity as they look at the world, but it also means that we feel strongly about the nutritional things our kids put in their bodies — the fruits, vegetables, carbohydrates, and proteins that fuel them to do all of the other things they do at EXPLO (running, playing, painting, reading, Numa-ing). 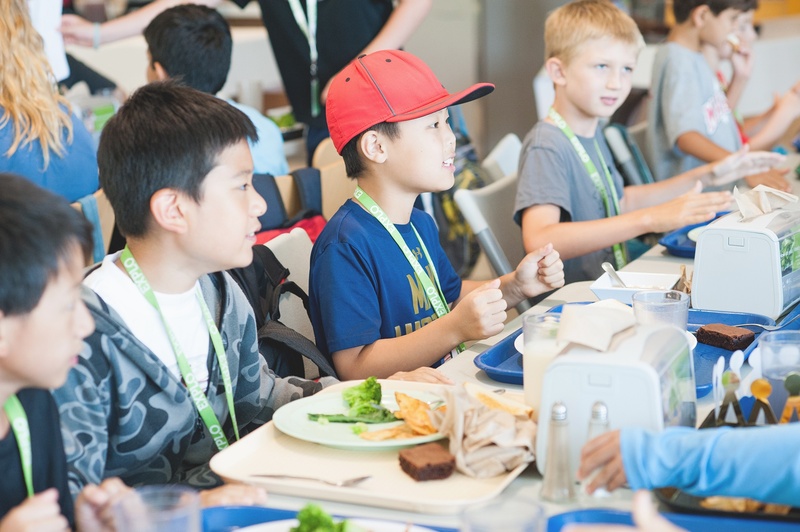 Working with Wheaton College’s dining services, we work to plan and provide thoughtful menus that reflect the eating interests and needs of our second graders and seventh graders alike. 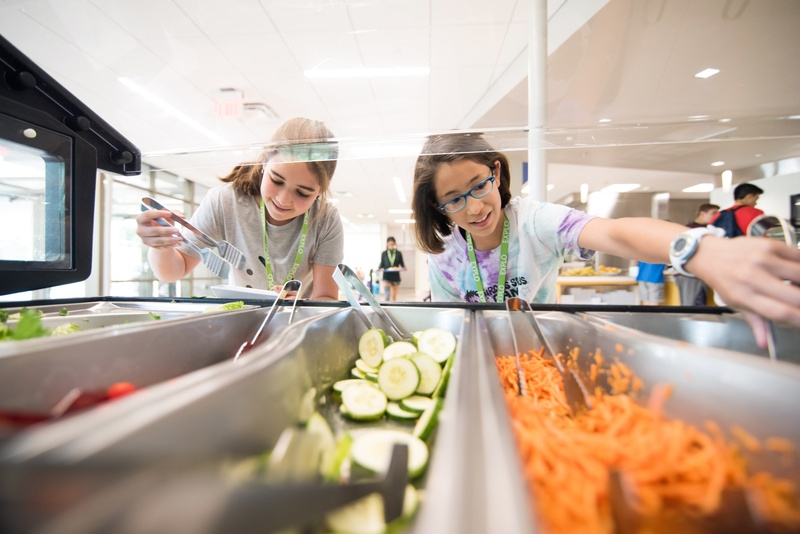 This means that, alongside the foods kids love to nom — chicken tenders, pizza, french fries — we also offer fruits at every meal, a salad and sandwich bar, hot meal options, and vegan and vegetarian options to provide growing bodies with healthy meals. Additionally, we work closely with dining services and our Dean’s Office to support our students with food allergies and those that keep kosher. We strive to make our food options interesting and exciting for our students, too — that means special Wednesday night community BBQs on the quad or fresh-popped popcorn and churros at Carnival Night. Years ago, EXPLO’s executive director, Moira Kelly, was visiting the junior program and stopped to have lunch in the dining hall. As she stood in line among the students (there’s no cutting the line at EXPLO, no matter who you are!) she noticed how beige one student’s plate looked, save for a single pop of color. And in that moment the disclaimer to “one green thing” was born. Like everything else at EXPLO, it's about trying something new. (And we know just how hard it can be to get a kid to eat a piece of broccoli!) By gently encouraging students to "color up their plate" a bit, they're usually a little more willing to try those non-beige offerings. Sometimes — almost miraculously — they also really like them! 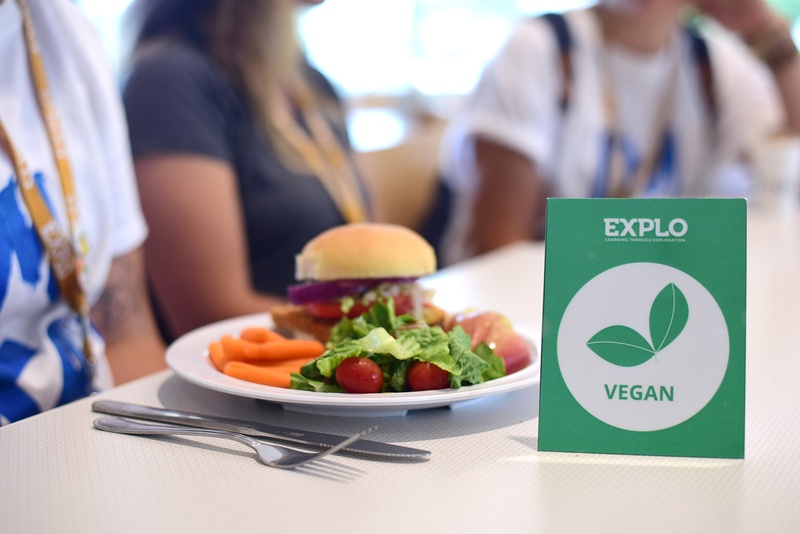 Healthy eating is a priority for us and it’s a part of the culture at EXPLO. 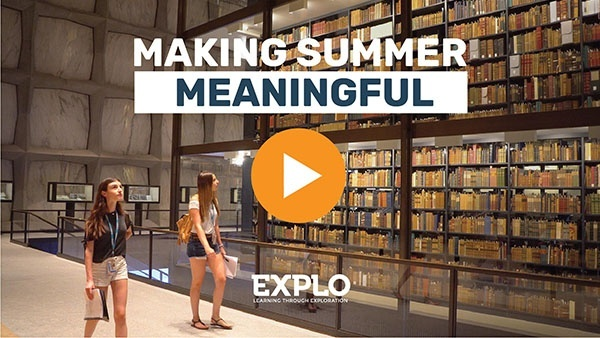 Adam Van der Sluis, former Dean of Students at EXPLO at Wheaton, talks about this culture of healthy eating, and how with time, it becomes a fun thing that students are actually encouraging each other to stick to. To ensure the safety of our students with tree nut and peanut allergies, the dining options at EXPLO at Wheaton are nut-free at all times. But food safety doesn’t stop at the dining hall. Students are also not allowed to bring snacks or off-campus food into their residence halls and rooms to take every precaution possible for the health and well-being of everyone in our community. If your student has special dietary requirements, please call our Norwood office (781.762.7400) before the start of the program to make appropriate arrangements. 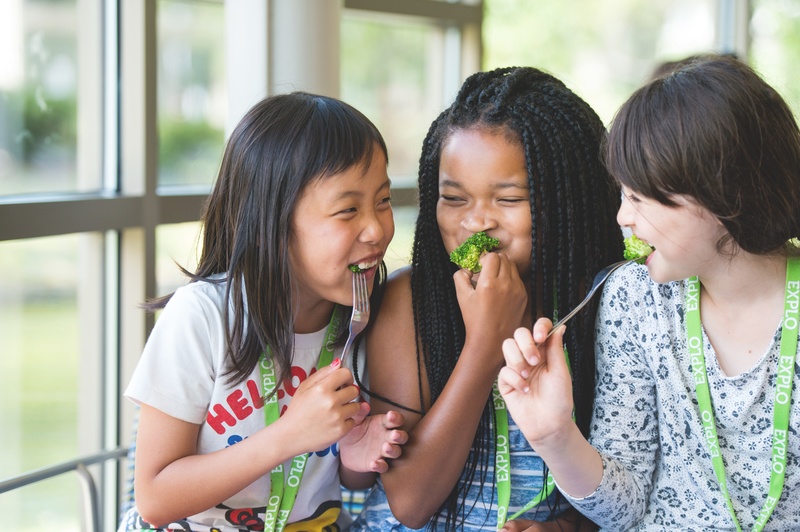 Mealtimes at EXPLO are not only a time to fill up with an healthy and interesting variety of foods; they’re also another opportunity for students to shape their EXPLO community. We are intentional about these precious minutes of the day. Time spent gathering around a table, eating with friends, and sharing stories is an important part of the day. 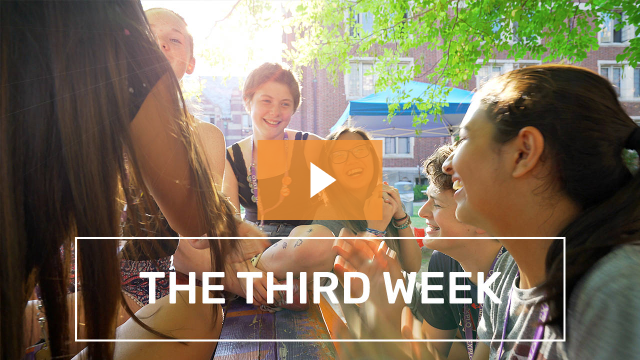 During all three meals, students sit with their Advisors and their Advisor Groups, a special time carved out in the schedule to spend with their “family” for the summer. “I love that the food at EXPLO is all different kinds. Soup, salad, pasta, corn, beans...I like to try some of everything!” he says. And it doesn’t end there. For Noah, one of his favorite meal times of the summer is the special Wednesday evening barbecues out on the quad where you can pick up a burger, veggie burger, or hot dog, along with some pasta salad and watermelon, and join your Advisor Group in a shady spot to watch the sun set over the Wall Ball Wall. “We talk about so many things,” Noah says of his time spent at meals with his Advisor Group. From the healthy and tasty food on the plate, to the rotating music that sets the tone and atmosphere, to the people you surround yourself with, mealtimes at EXPLO are truly so much more than just a meal.